Snowville is a popular stopping place for many people traveling to and from Idaho and Utah, as it provides one of the only gas stations and rest stops for many miles. Those who find themselves broken down in Snowville with engine problems or a flat tire will be able to take advantage of our Snake River Towing services. Our trained professionals are only about an hour away. You will be pleased with our Snowville towing service as we are prompt, friendly, and knowledgable in helping you make decisions about your tow. As a towing service provider in Snowville, we are able to handle several different types of towing situations. We are able to tow large semis to small cars at reasonable rates. Our towing experts have been helping stranded people for years and know how important it is to provide prompt service. We will send a driver immediately after you make your call 24 hours a day. So whether you find yourself broken down in Snowville in the middle of night or during the high sun of mid afternoon, we are always available to assist you. Snowville is a common spot for semi drivers to rest and fuel up. As a hub of travel along a busy highway, Snowville and areas in and around the town often see many semi accidents and breakdowns that result in a tow. 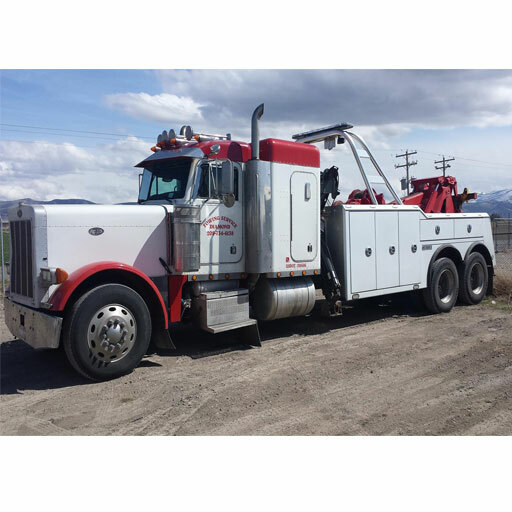 Our service vehicles offer heavy wrecker towing services in Snowville and surrounding areas, and we quickly respond to calls to help clear any wreckage or damage associated with semi rollovers or collisions. Our big rig towing team knows how to handle the processes associated with your accident, including completing the necessary paperwork and working with insurance companies so you can know you are in reliable hands when you give us a call. We provide all AAA members with complementary towing services as a benefit of your AAA membership. We are pleased to be a certified AAA towing company, wherein we represent the respect and integrity of AAA’s brand. AAA members stranded in Snowville may call us directly, as we will work with AAA to handle the billing of your services. This provides you with faster service and a guarantee that AAA will be able to handle any charges associated with your tow. We only hire the most competent towing drivers at Snake River Towing. Each of our drivers is certified by Wreck Masters to handle different towing jobs from small Class C vehicles to large, Class A vehicles alike. Being Wreck Master certified means they have received quality training and will be able to handle your vehicle with the utmost of care. Every driver can feel easy about their tow because they know their vehicle is in good hands. Not only are our drivers excellent, we also employ a courteous, helpful staff which we hold to the highest levels of standards in our industry. You will find us to be very friendly and detail-oriented as we work with insurance providers and police reports. Not only will you receive a quality tow when after your breakdown Snowville, you will also receive the best customer service in the industry. If you find yourself broken down in Snowville, don’t worry yourself about what to do. Call Snake River Towing at (208) 878-4357 to get help with your tow. We will help you get back on the road and earn your trust as the premiere towing service provider in Snowville.